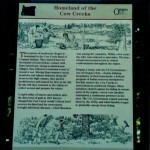 This portion of the southwest Oregon is homeland to the Cow Creek Band of Umpqua Indians. They thrived here for thousands of years before contact with Euro-Americans. Living in plank-house villages, they followed a seasonal round of resource use. Moving from summer camas meadows and salmon fisheries along the rivers to the high country, they picked huckleberries and hunted for deer in the fall. By late fall they returned to the valleys to collect acorns and prepare for winter. A rapid influx of miners and settlers after the discovery of gold in 1851 forever changed the Cow Creek world. Critical food sources declined and the newcomers brought infectious diseases – Chief Miwaleta was among the casualties. Within a few years the tribe was reduced to starvation. The loss of land and resources led to violent confrontations throughout the region. 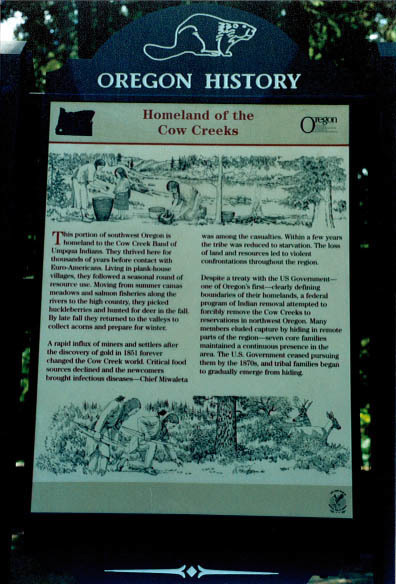 Despite a treaty with the US Government – one of Oregon’s first – clearly defining boundaries of their homelands, a federal program of Indian removal attempted to forcibly remove the Cow Creeks to reservations in northwest Oregon. Many members eluded capture by hiding in remote parts of the region – seven core families maintained a continuous presence in the area. The U.S. Government ceased pursuing them by the 1870s, and tribal families began gradually returning.